I've been a little obsessed lately with vintage inspired accessories, fabrics and patterns...here are just a few of my favorite finds for the home. What vintage resources do you love? clockwise from top left: Toboggan Shakers; Needlework Pillow; Wise Ol' Cookie Jar; Sunny Woods Rug...all from Anthropologie (one of my favorite stores!). 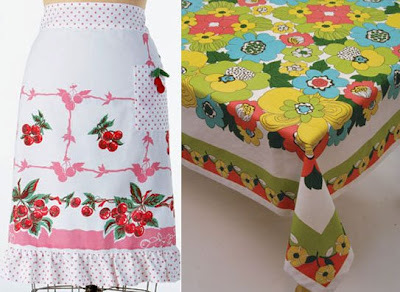 Via Moda Home, the Apron Cherry and Summer In The City Tablecloth. 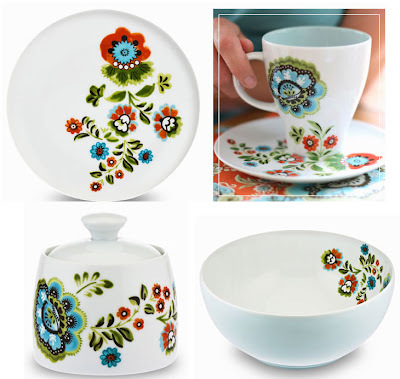 Vintage Botanica Dinnerware from Amy Butler. I love this collection! The patterns are so fresh and simple. in designing any space i would always have to try to incorporate vintage with new or modern. gives the space an interesting time texture. allows a space to have history mixed in with a future history. 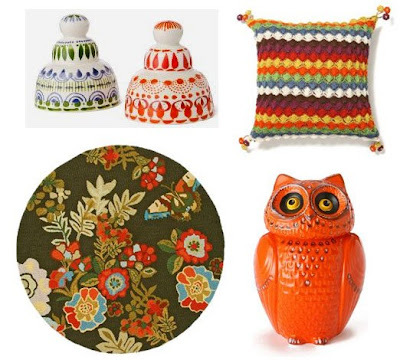 ooh i knew that little owl was from anthropologie! it's definitely my favorite store for vintage-inspired goods, but for the real thing, i hit up local flea markets. I had no idea Amy Butler does so much! She is so talented!!! FLEA MARKETS! the bst place to find exactly these items but at half the cost! i've been collecting owls from flea markets for years and have a nice collection. such vibrant colors! i love the owl cookie jar and am definitely thinking of getting it, thanks to you! i love antique malls as a vintage resource! i have two very large ones very close to my home. i could spend days in them. not only are they great for finds, but for inspiration, too! and yes, Anthro is a great resource. they are in tune with what is vintage chic and vintage modern. possibly my favorite store on the planet! also, your blog is amazing and a wonderful resource! you are quite gifted! glad to have found it! These are so fun! Love the dishes!!! Botanica Dinnerware is absolutely beautiful. Oh wow I totally love it - so fresh and fun! I didn't know Amy Butler was doing dishes! They all look wonderful. Your collection of images are great! My favorites are the round rug in the first set and I also love the design in the Amy butler dinnerware. So much inspiration!